Pompano (Trichinotus Blochii) commonly known as Silver pompano (American pomfret) is one of the most highly desired marine and a high value fish. Its flavor is excellent and its monetary value is high. The commercial catches are not large. It belongs to the genus Trichinotus of the family Carangidae. From Biological Stand point, the Pompano is highly suitable for farming. It is commonly found in Indo-pacific region. 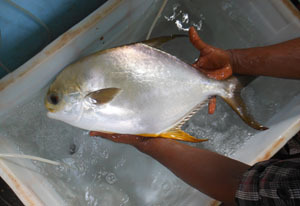 Silver Pompano is becoming more popular in the Indian Aquaculture sector . A cultured pompano ranges from 250 gm upto one kg. They reach a size range of 450-550 gm weight in 8 months culture period. Silver Pomapno is widely cultured in USA, China, Taiwan, Malayasia, Indonesia, India, Vietnam and Philippines. Silver Pomapno is an alternative species for low salinity (5 to 35 ppt) shrimp culture.